Because this string of thoughts continues to unravel and then fumble upon itself, we will discuss this second edition on thread, in 3 sections. The first section will talk about a few technical things of thread construction that we missed last time, the second section will record notes on new threads being used currently, and the last section will follow up with further questions, concerns, and any other fleating thoughts on fibrous elements that have been wound together. Over the last several (several) months a few new threads have been worked with, opening up a little more of the stitching window. Some of the thread has been for hand stitching, and some of it for use on the Brother DB2-B791-015. This has raised questions like, which direction the thread is wound (left or right, left hand thread being what most all sewing machines require), what coatings on the thread do to ease use or strength, and what happens when threads stretch. As has been noted in recent posts, the Coats&Clark “button & carpet” thread has finally been mastered. The stiff and dense thread mainly needed two things; higher tension settings, and a more suitable needle size. The material chosen to test it with was several layers of rawhide, and several layers of dive belt webbing, on separate occasions (the rawhide used for the Chukka/Desert Boots, and the dive belt webbing used on the Mini “Messenger” bag). It is clear now that the Coats&Clark “button & carpet” thread is very dependable thread which offers superior strength and clean stitching for something so easily found (it is available at almost all sewing & craft stores). Part of it’s strength comes from dual compound fibers. Apparently what the “button & carpet” thread is, is a polyester sheathing with cotton core. What this should be doing is keeping the overall gauge of it down, but integrity up. Theoretically, the cotton core provides the strength, and the polyester sheathing makes it less susceptable to abrasion in high-stress, high-friction, sewing conditions. These jeans are made with 100% silk fibers. These jeans are stitched together with 100% silk thread. Normally that would not be the case but while shopping for materials at the fabric store these little spools of thread showed their face before the normal Gütermann “Heavy Duty” 100% polyester thread appeared. While many different thread types have been tested for jeans production: Coats&Clark’s “extra strong” quilting thread – for a very subtle topstitching affect, Gütermann’s “extra strong” 100% polyester thread in the 3oz. cone – because, well, it was plentiful and has proven to be very durable, Coats&Clark’s typical “all purpose” thread (which is also 100% polyester) – because it is cheap, Gütermann’s “heavy duty” 100% polyester thread because it had the best color and texture, and of course now Gütermann’s 100% silk thread (however, Gütermann makes more than one type of 100% silk thread – the type used here came in a 30 meter length, it is the coarser of the two most common silk threads that they offer on the shelf [the other comes in a 100 meter length]) – the most effective (for jeans) has always been the Gütermann 100% polyester “heavy duty” type. After using the others the Gütermann seemed to have the best finish and look (it had the best density, and size wise – looked best against the tooth/grain of the denims being used), while also being very strong and easy in the machine, also it has a bit of elasticity so it takes shape well and almost has the ability to influence form depending on how you run your thread tension. The biggest draw-back is that it (like the silk) only comes in the 30 meter spools, so you tend to have to change out your bobbin and top thread a lot. Also because of it’s girth, you may want to use up to a #20 needle, here a #18 is generally used, but that is about the minimum, as any smaller needle would probably not let the thread run though freely enough. 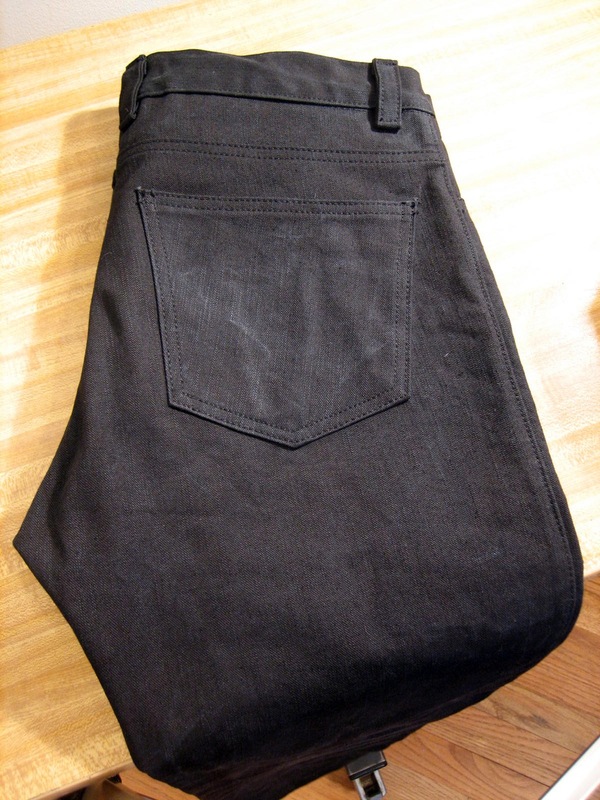 The Denim, is a no name black dyed cotton weave. This particular batch was picked up at Michael Levine’s in the L.A. fashion district about 10 months ago. It had been chosen before and proved to have very good building qualities, it irons very well – even when ironing in the curves for pockets – , doesn’t fray too much, is very stiff – holds it’s shape well, and has a beautiful finish (as long as you do not wash them too many times, or put them through the dryer, obviously this a huge moral dilemma, for the new ones they will probably never be washed, at most dry cleaned – these jeans are not like many others). 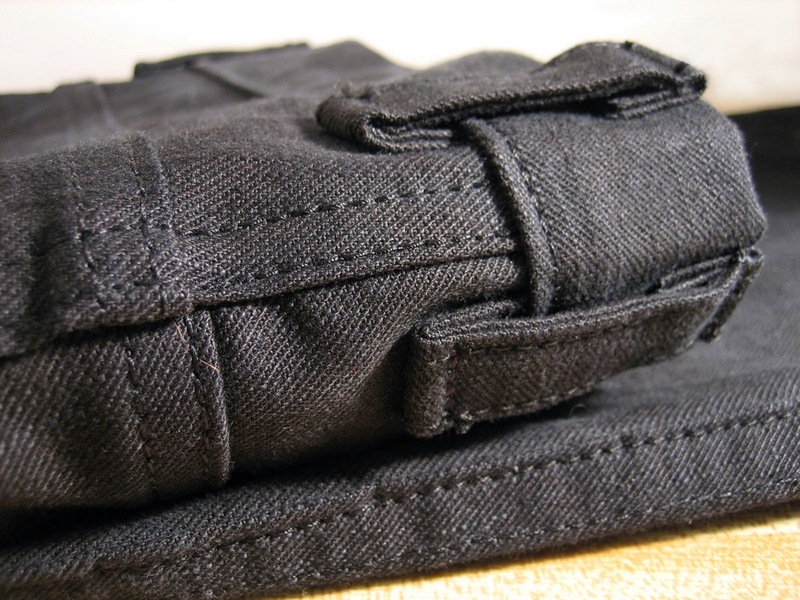 The first pair of jeans made with this denim – about 1 year ago – turned out well enough, which is why it was put on the back burner to purchase more of it and use it on a rainy day. In the meantime, the first pair have been worn around and used regularly, wearing them is a slight learning curve because as it turns out the denim is VERY stiff, and doesn’t allow a lot of freedom of movement, these are definitely a dress jean – the old and the new. 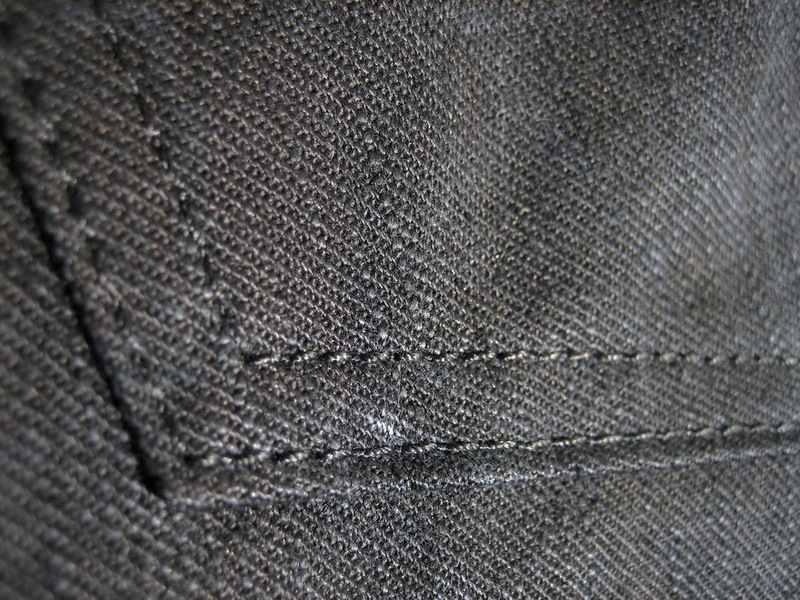 While this may sound un-utilitarian, or sacrilegious, consider that jeans are just as much a support as architecture, and in many ways these two are mimetic of each other, the jeans should not be confined to one context – perhaps that minimizes their potential, and undermines garments as a whole. Anyhow, the first pair were made with an orange-yellow thread that for it’s intention worked out well, but aesthetically could have been improved, and with a few glitches in areas like the zipper configuration, it was obvious that more of this black denim would be to an advantage later on (in case it disappeared from the racks if nothing else). In fact, not long after making the first pair of jeans with this peculiar denim (using the Gütermann 100% polyester “heavy duty” thread – the orange-yellow) – Work Custom Jeans of L.A. made a small production run of about 20 (?) for an L.A. boutique called Scout (although theirs were all black, the denim and topstitching). Which was a funny coincidence, because at the time the black ones which were made here* were on display at an equally selective venue**. Back to the present. These are the most current jeans made on the Brother DB2-B791-015. The silk thread was picked up because the fabric store did not have the usual Gütermann “heavy duty” thread which has become the standard jean thread to use. Although, the silk thread had an obviously nice finish, and considering that silk is a natural fiber and maintains a very strong tensile strength, the choice really was not at all outlandish. 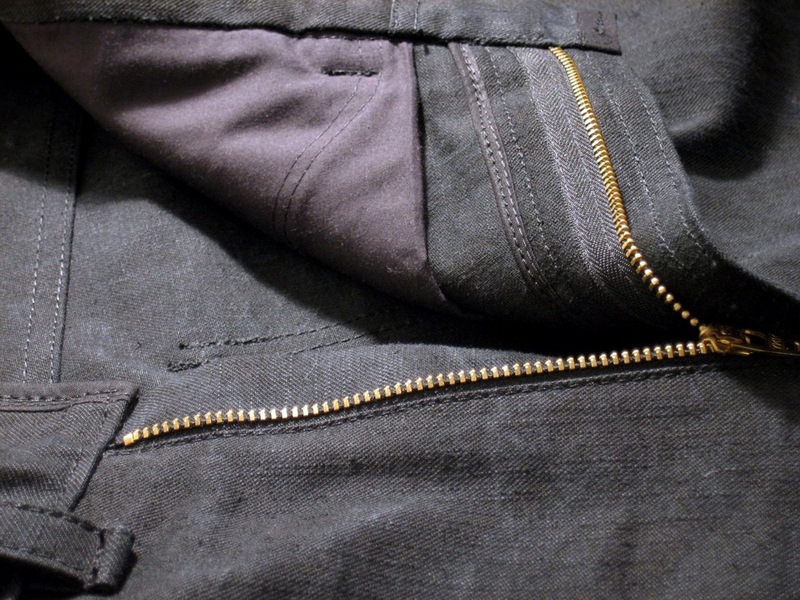 There are a few internal areas that used a lighter weight “all-purpose” thread, around the zipper, and on the first pass along the outside seam for securing the bias tape (used in place of an over-lock stitch). For the zipper and it’s two adjacent components the “all-purpose” thread (with a #12 needle) works the best because it seems to sink into the materials better and create less bulk, using the silk thread or the “heavy duty” stuff might end up with a bit too much density where it is undesirable (the “extra strong” quilting thread is a good option here too as it has added strength without the added bulk, although the quilting thread does not quite run as freely as the “all purpose” so you have to choose accordingly and pay attention to your needle size to ensure that the thread does not hang up on any small spaces). 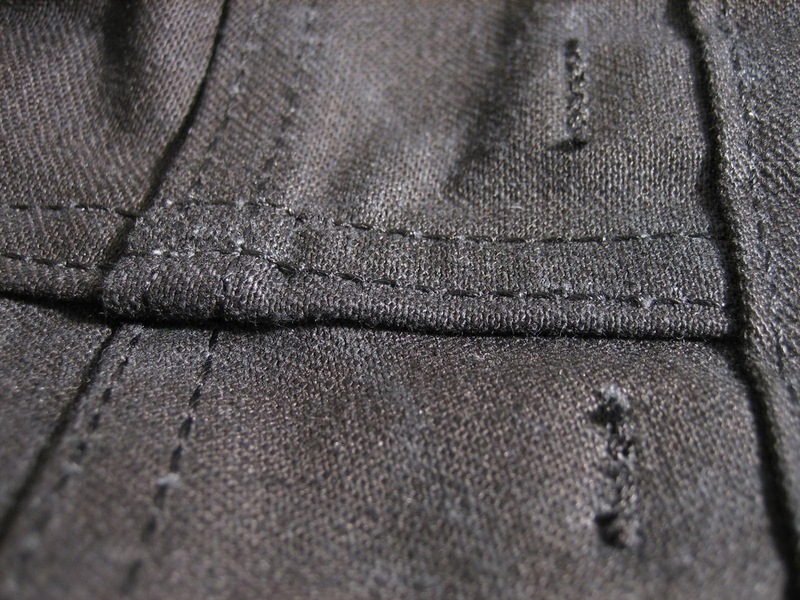 The “all-purpose” thread was also used for stitching the pockets bottoms and the little denim panel that resides across the top – to act as a backdrop behind the radius created by the front panel that is the slot for reaching into your pocket. 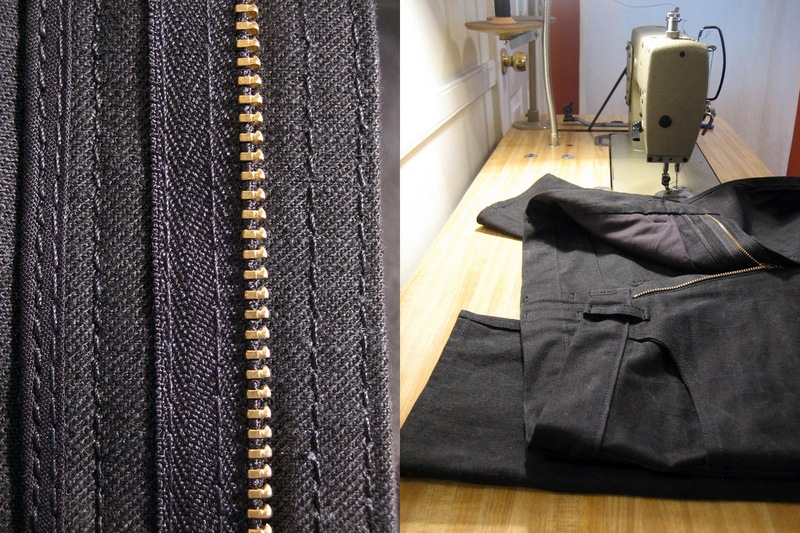 With the pockets made and the zipper component completed the initial phases of pattern cutting began. The front panels were ironed and made to fit the pockets, the pockets were ironed and this was all stitched together. Then the zipper was stitched in, which in turn fits the two front panels together and completes the first phase of the jeans. At this point the back panels began construction starting with cutting out the full panel, the top panel inserts and the back pockets. Once all of this was ironed into shape it was time to stitch again. The back of the jeans went together quickly and easily, having the reverse feed, made finishing off the pockets a snap, the tops of the corners were well tacked and there was no need to switch out the foot or even the usual hassle of re-setting the stitch length. One of the other huge benefits of the Brother is that it is so much easier to set the stitch length – it is only a matter of adjusting a small knob while holding the reverse lever down – whereas on the Singer you had to stop the motor, clear your thread, hold a little button down in the middle of the base plate (flat-bed machine), roll the manual feed pulley forward so that it audibly clicked out of the stitch length position you wanted to change and then run the pulley forward until it was aligned approximately with the area of the notch that corresponded to where the new stitch length was designated, let go of the button and kind of massage it into place. Okay. Another interesting discovery while putting these parts of the jeans together was the possibility of using a 211 compensating presser foot as the everyday 1/16″ gated presser foot. This became a clear possibility as the 211 foot sews very clean seams whether in a radius or not. Considering that you can pick up 211 presser feet justified to the left or right, and get 212’s and other sizes, this may be a solution to the customized feet. After getting the front and back panels all together the slow and important step of ironing and pinning the inside seam began. This is the kind of thing that just takes time and a bit of finesse, without a “folder” this seam can only be done with accuracy by ironing each edge back by about .5″ and then assembling those together like a lap seam, pinning, ironing again, and then carefully laying the stitches in. Unfortunately this step still had a little glitch in it, and after sewing in one length of the double stitched seam, it was apparent that the other side was going to have to be done from the back to ensure proper material feed. The only reasons why this is a downer is because it causes the stitching to not match, one row will look nice and tight, and the other will look less so. Also there ends up being an inconsistent gap throughout the entire length. In the future, more time will be taken to make sure that all of that length is as consistent as possible. Next was the outside seams (going along the outside edge of the leg). These are made by using a bias tape, to keep the fabric from fraying, and ensure that the stitch is consistently about 3/8″ in from the edge. After the bias tape is completely in, then an added length of stitching is put in with the topstitch on the outside, folding the seam to one side, this is done to fix that seam as flat as possible, so that in the future no excess ironing is needed. With the main body of the jeans finished, the waistband goes in, the belt loops, and then hem the legs. The waistband is usually a push and pull tug of war. It will go in just fine, and function just fine, but there will always be a few puckers that need-lessly annoy. This time around, the waist band was folded and ironed in like a large piece of bias tape, which works well, and prevented most of the puckering. 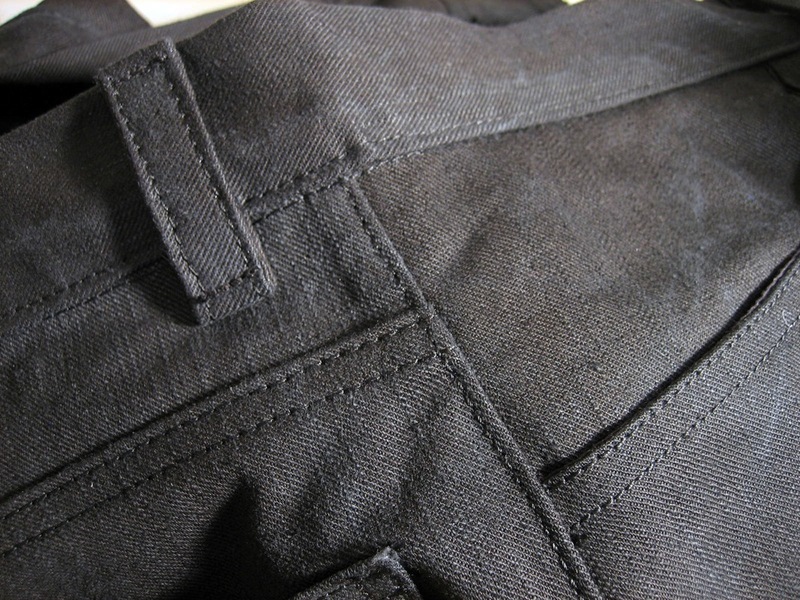 While that was being installed, one end of each of the double-faced belt loops were inserted just slightly under the outside lip of the waistband. 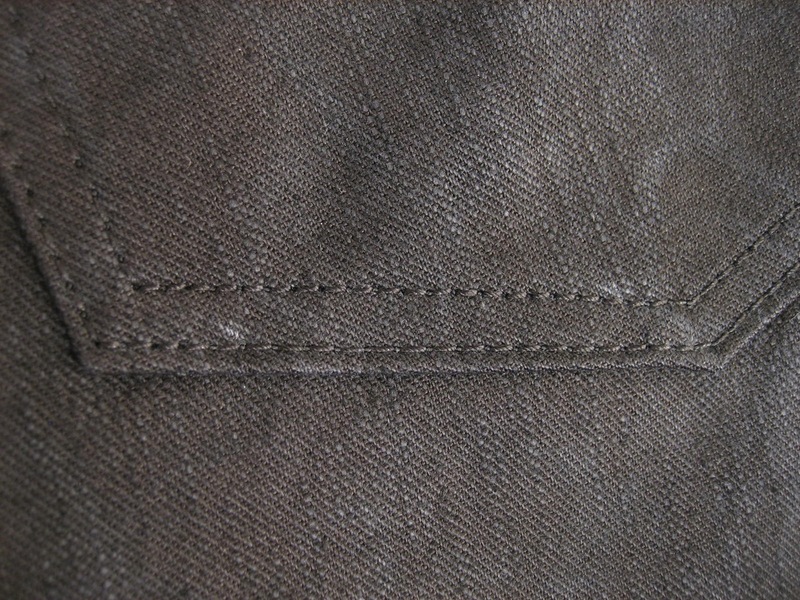 By double-faced belt loops, imagine a belt loop that looks the same on both sides (one of them is basically two belt loops sewn together with their backsides facing each other), again, this is a tactic used to supplement the fact that there is no serger available to the Brother DB2-B791-015 and company. The only drawback to this belt loop is it’s thickness, when you go around the final perimeter of the waist and tack in all 12 ends of the belt loops, this thickness becomes a truly crucial area because of how short a pass you have to make over it back and forth to tack it down, if a belt loop were a few inches wide this forward-reverse-forward dance would be a lot easier to control and a lot easier on the machine. However, next time, this tactic will be refined by using a very lightweight material for the back side, rather than doing the two layers of denim that were done this time – this was an obvious way to fix the problem in hindsight. Lastly, the hem. This is always a kind of slightly arbitrary exercise, and luckily this time the hem length was right on the mark, but with almost no bunching at all, so if there is one good wash, with warm water and hot air to dry (which is not in the schedule, but if it were) then that hem is probably going to shrink up and look a bit short. Next time. In the end these are a truly handsome pair of jeans that should see a fair amount of use when the occasion calls for it. There is even enough of this intriguing black denim left over to make yet another pair, so it’s only a matter of time until then. For now these will be the new envy. *Actually the first pair of jeans made with this denim were made on the Singer600WI, not the Brother DB2-B791-015. There was little learning curve transferring between the two, the greatest advantage of the Brother was having the reverse feed that simplified a lot of small tasks. The actual feed of the Brother also helped, namely in the most strenuous areas like the juncture between the back panels where the four quadrants all come together slightly above and center of the back two pockets. **It should be repeated, that this was a coincidence. PostScript; Another good link to find Work and Scout is at The Refinery (or). PostPostScript; This is too hard to resist, the presser foot of all presser feet.